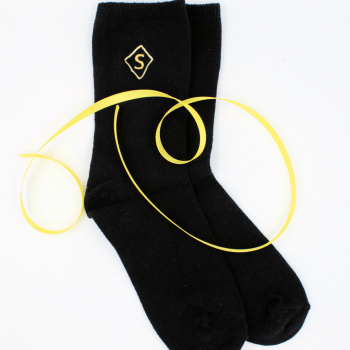 A pair of custom embroidered black socks with embroidered initial in diamond border, select from mens or ladies. Black cotton with lycra socks available in mens or ladies size. Style may vary from that shown, socks are solid black and embroidered with a single monogrammed letter in a diamond shape border on each. Black cotton with lycra socks available in mens or ladies size. Style may vary from that shown, socks are solid black and embroidered with a single monogrammed letter in a diamond shape border on each. Select the socks size and the embroidery text thread colour for the initial. A nice personalised gift for men and women for any occasion.